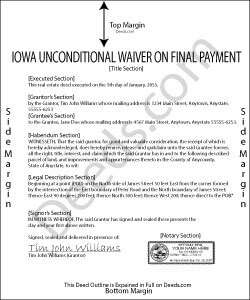 Use the final unconditional waiver when a full and final payment is made and collectability of the amount due amount is not an issue. The unconditional waiver should only be granted when payment is made through a verified method. The waiver is effective up to the full amount due and the claimant waives any lien rights without condition. Donald C. said: No review provided. JOHN P. said: I thought your service would comply with my request quicker. Reply from Staff: Looks like it took 4 minutes to complete your order, sorry it took so long. Regina A. said: I needed to look for a recorded document and found what I was looking for. Thank you for the great service. Jesse B. said: Bought a quit claim deed form. Came with great instructions that were easy to follow and allowed me to do it over a couple of times until I got it right. Was also cheaper than most other options I found online.